I'll just throw another name into the hat. Im_Not_Creative_Enough wrote: I'll just throw another name into the hat. It's really too bad for her that no one says that. Oh god. At Rodoh1.0, the original bunny, LGR, had a "theory" (=manner of trolling) that held that the Kremas were actually Auschwitz's bakeries because where else did bread for the camp come from. This became quite involved. It was an advanced form of "Krema denial." I believe Peter Gast/shyster was his only fellow traveler on that particular troll. What buggles me is where did she came up with the "15 ovens" number. I've never encountered such a claim even in the most ape-$hit denier rants. I think her claims are half-baked. Statistical Mechanic wrote: I think her claims are half-baked. Are we talking about Auschwitz-Birkenau? From old notes, not very clear, 1) Pilecki escaped from a bakery near the Stammlager IIRC, 2) there’s a construction report in late 1942 mentioning a Birkenau-situated bakery being built with at least 2 ovens, 3) plans for a super-bakery and other information on bakeries in the camp are in ZBL archive, which I haven’t read (apparently the super-bakery wasn’t built), ditto WVHA Amtsgruppe W files, 4) from 1943 there are bills for renovation of a temporary bakery, 5) there’s an item about a “Brot Fabrik,” 6) the Anhalt firm built a bakery in the camp during 1942-1943, 7) the firm Deutsche Lebensmittle GmbH operated a bakery supplying the camp, etc - so what is being discussed here? Does the denier give a location? IIRC I've not read good detail on where the bakeries were located, not saying it doesn't exist . . . or the amount of baked goods produced . . . or whether local bakeries provided bread also . . . and so on . . . which people say that the magic number 6m loaves were baked at this bakery? Can't be. Remember David turning on the heat at Treblinka's "Hot Buns and Bagels". scrmbldggs wrote: Can't be. Remember David turning on the heat at Treblinka's "Hot Buns and Bagels". That has eluded me. It has to be Auschwitz, 'cuz of 5 years. But both were Holocaust centers, right? Im_Not_Creative_Enough wrote: What buggles me is where did she came up with the "15 ovens" number. I've never encountered such a claim even in the most ape-$hit denier rants. 5 ovens with 3 muffles each in Krema 2, as well as 3. Anyway, it gets worse. Acc. to a recent denier meme there were 4 ovens there, which could burn 400 corpses in 5 minutes. On another note, Gen Baugher totally swallowed the Lesser Bunny's* droppings. * From now on LGR is the Lesser Bunny. Is Andrew "David" Allen still around? From 2010, Bunny droppings, they have a long half-life, Jesus wept. Sure, David aka IHR's Andrew Allen aka Ceacaa aka a Mossad asset (Carto's words). I didn't know. Given the quality of his comments here, and that he never learned the quotation function here, I never gave him credit for being able to produce anything. Anyway, he's done several drive-by's (Alison Chabloz, Russian ice dancing, Anne Frank, Hunt's Nordhausen thing, stuff like that) since last summer but not posted at all regularly, really since his Majdanek pleadings went up in smoke. IIRC that was his last regular participation. BRoI's changed views - David had been defending BRoI's YouTube for over a year - probably confused him. I think he peeks in from time to time but no posts since February - and that was his first in a month or so. See, Popeye. There is real history supported by real evidence. sight. It only demonstrates the intense controversy that surrounds discussion of claims of human soap factories and underground trick shower/gas chambers and underscores the need for open debate. accuse Revisionists of spreading Hate. Holocaust Belief as a cult. magically disappearing bodies, a million dead at Majdanek. Last edited by Sergey_Romanov on Sun Apr 23, 2017 6:43 pm, edited 1 time in total. Given the huge revisions made by professional historians to the Nuremberg Stories, the hysterical response of Believers to Revisionists seems irrational. Why this insistence on trick underground shower/gas chambers? "Ugly Myth" is another stable fingerprint of both "David" and ceacaa. Sergey_Romanov wrote: Oh lookie there. So he goes as "David Merlin" too? Matthew Ellard once accused our David of plagiarizing Merlin (well, I started it)! I also wrote this post about Merlin. Merlin sent the USHMM Hunt's Nordhausen link LOL about the time David posted here about Nordhausen. The man of many names but little knowledge. alas before my time posting on HD . . . he really does make the "apocalyptically thick (0-9%)" tier . . . wonder what's become of him? Probably uses the pseudonym because he's hated by a large chunk of the old guard (Cartoites etc.). LOL yet he couldn't hold his own in a junior forum . . .
Pssst, David, any chance we met each other at a water cooler here at the Mossad secret lair? Thanks - to the anonymous person who pointed out this uncanny coincidence. David also copies from Fred Berg's http://nazigassings.com/. I will point his plagiarisms in the future. David claims to have a personal relationship with Fred Berg and once posted what was supposedly an email from Fred Berg to "Andrew" ( David's supposedly real first name). I dismissed this as another of David's fabrications. There is a post - maybe Matthew who can recall it - where Matthew alluded to David's being Andrew Allen's partner. It's there downthread, but it was tongue-in-cheek. New Zealand LGR has had quite a collection of self dreamt-up monikers. 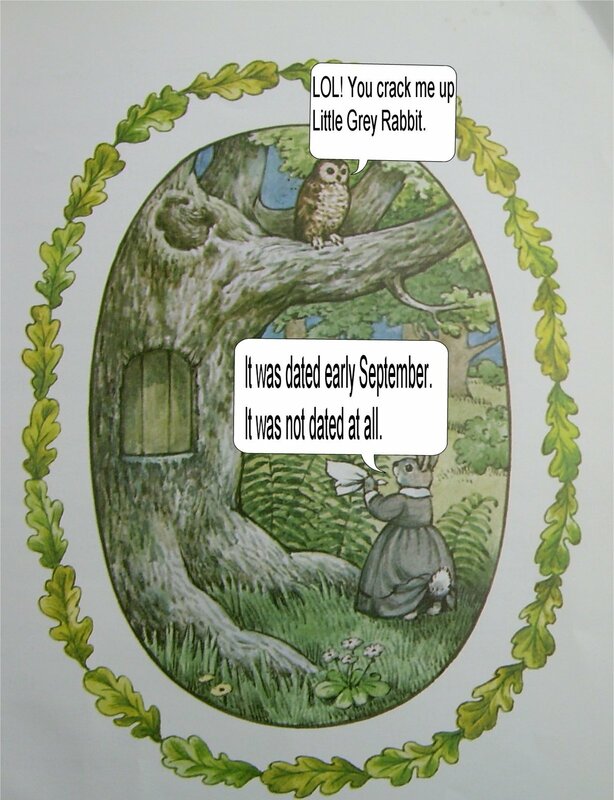 The silliest one of all is definitely Little Grey Rabbit. Was he also referred to as "the odious one," and "that grey eminence"
I found this myself on an old hard disk drive. It might be significant. But what does it mean? Yip. Colonel Blandish, ah yes. Before there was ever a WhoamI or any of the rodoh period namings. Nice image above . . . good times.